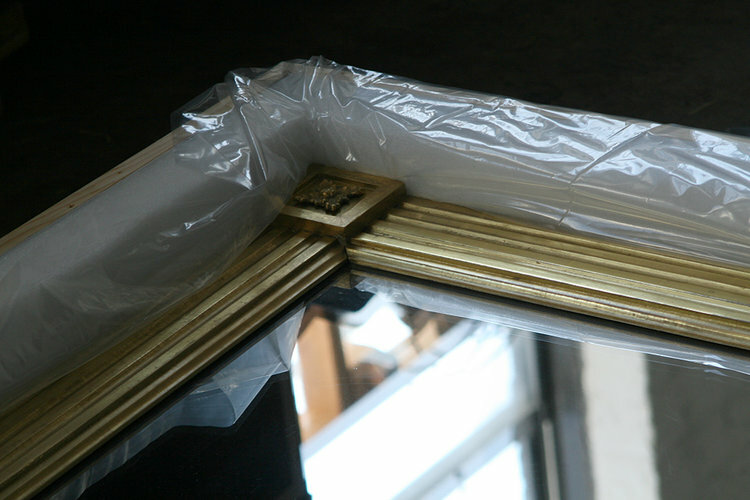 Moisture Damaged Oil Gilded Framed Mirror — Bernacki & Associates, Inc.
Issues regarding surface protections and a stable environment are most important when dealing with gilded objects and furnishings. There are two basic techniques of gilding onto a wooden substrate. The first is water gilding, which uses collagen glue and oil gilding, where the gold leaf is adhered to the ground by an oil- based size. Water gilding is laid onto a porous ground, like a gesso surface, which allows the glue to penetrate into the substrate and bind not only to the gold leaf but also the ground itself. The second basic gilding technique is oil gliding which is applied to a solid substrate such as bronze, stone or wood. Traditionally oil gilding is used on outdoor sculptures and architectural details while water gilding is used on frames, furnishing and other interior decorative details. Water gilding can be burnished to a highly reflective shine, while oil gilding cannot. Each process has its own application methods and materials, as well as aesthetic capabilities. These two different types of gilding finishes impinge on the inherent nature of the materials and the matrix of how these materials work together and are affected by outside circumstances. An oil-gilded mirror measuring seventy-five inches high and seventy-eight inches wide was stored and locked for several months at private storage facility on the top floor of a warehouse building. 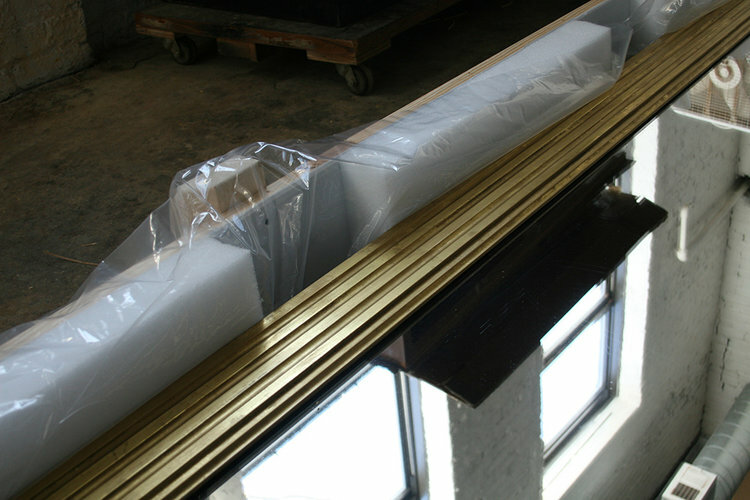 The mirror had been blanket wrapped with moving pads loosely taped along the folds, and placed in a plywood crate fastened together by screws. The crate and mirror were staged upright against a partition wall in close proximity to a skylight. environmental instability. It was also evident that the fibers of the blanket had caught sections of the rosette corner blocks and been pulled away from the substrate. Small pieces of ornament, gesso and gilding were entangled in the blanket or lay at the bottom of the crate. Minor abrasions were scattered across the glass. Mold had begun to grow along the lower sections on the outside face of the frame. 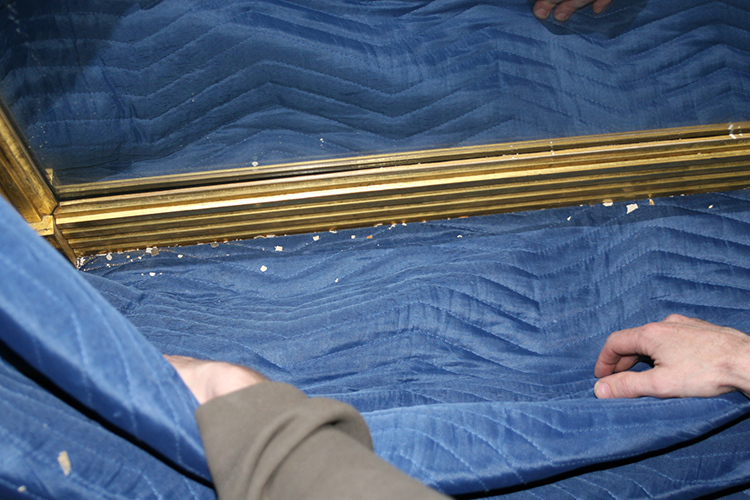 Damage that happened to the giltwood mirror when moisture exposure caused the moving pad to become attached to the water based gilding. The pad could not be removed without damaging the gilt surface. Detached pieces of gesso and gilding that were additional byproducts of the moisture infiltration and inappropriate wrapping. All detached sections of ornament were collected from the crate and blanket and mapped out as to their original location on the mirror. 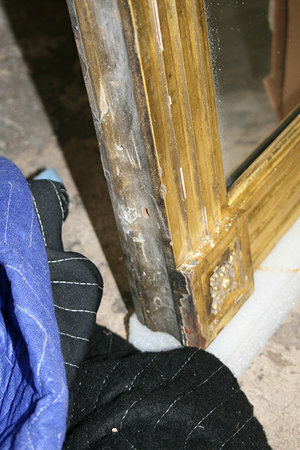 The biological growth on the surfaces of the frame were treated, and the entire mirror was then cleaned of dust, debris and surface residues to allow for conservators to specify the type of gold leaf to apply and the tone of bole needed for matching the new areas to the existing tone and color of the original finish. Once the materials had been specified, all loose and lifting sections of gesso and leaf were consolidated. Areas of loss were rebuilt to meet the existing profiles and sections of ornament that had missing details were either re-cast or built up with gesso and carved back to blend with the original compositions. Given the large amount of surface area and the severity of the damage, this process took several days to complete. The gold leaf applied was a twenty-four karat French leaf. Once the gilding had been competed the surface was covered with a micro-crystal wax for protection. The restored mirror was secured in the custom built crate.